The luxurious 250-room hotel reopened its Ballroom Suite last year following a seven-week restoration. Taking inspiration from its original 1930s design, the elegant ballroom boasts mirror panelling, domed ceilings and three 1930s-style chandeliers, along with improved AV. There are also 16 4m-high wall pillars made with royal blue gemstone. It is now claimed to be the London's only venue to offer a la carte dining for up to 500. The suite also includes the refurbished Crush Hall, Silver Room and the Gold Room. The grande dame of the London hotel scene continues to lead the pack when it comes to capacity. The historic Great Room, which originally housed the ice rink where Queen Elizabeth II learned to skate when the hotel opened in 1929, can now seat 2,000. 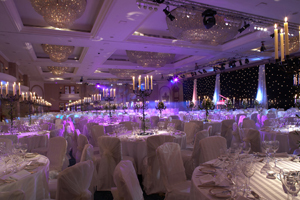 High-profile events at the venue include the Bafta Dinner and the Mercury Music Awards. 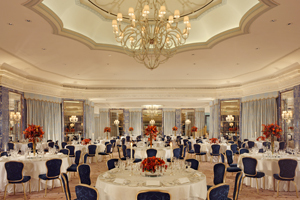 Competing with the nearby Grosvenor House on capacity, the Park Lane property's largest space is the Grand Ballroom. The elegant 937m2 space can accommodate up to 1,250 people reception-style, or 1,100 for a banquet. Its crystal chandeliers add a touch of glamour, while its dedicated foyer and high-spec AV are designed for modern events. The flexible space can be sub-divided to cater for 70 to 400 delegates. Perfect for large-scale events with a touch of grandeur, the hotel's ballroom offers a high ceiling and natural light, with space to hold 500 for a drinks reception, or 348 for a dinner-dance. Originally opened as The Great Central Hotel in 1899, the 300-room property is next to Marylebone Station. Sir George Gilbert Scott's distinctive facade ensures delegates are impressed with the building's sense of history even before entering the 245-room hotel. Its largest space, the Hansom Hall ballroom, can hold 320 for a banquet or 550 theatre-style. Set in the space where Hansom Cabs formerly dropped off visitors to the hotel and station, it boasts the original glass roof from 1873, floor-to-ceiling windows and a large terrace.